Stress is a reversible condition where energy or other survival factors become limiting, and a system, or one of its parts or processes, begins to operate near the limits for which is was designed. Photo above left - The black "sooty mold" shown here on the leaves of this Red Oak (Quercus rubra) is a sign of aphid infestation. The mold grows on the sticky aphid byproduct. The oak is stressed, likely due to limitations in the rooting environment. Stressed trees are attractive hosts to pest and pathogen infestation. 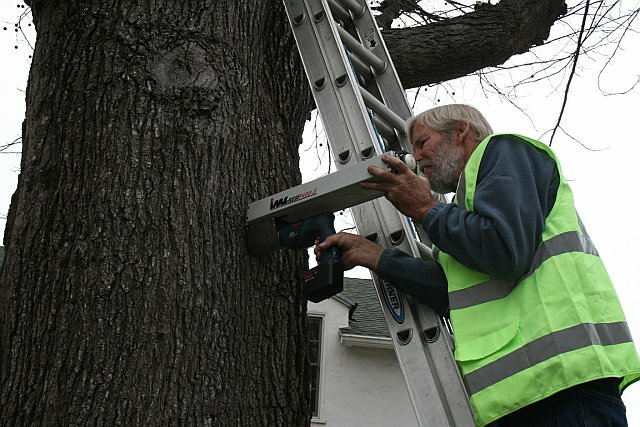 Photo above right - A Resistograph is a tool which uses a small, pressure sensitive bit to penetrate a tree from the outside to determine the thickness of sound wood surrounding a suspected decay deposit. Trees can be up to 70% hollow inside and still maintain structural integrity.